This is a staple for lunch around here. I'll make several days' worth at one time, slice it, and keep it in the fridge to toss on top of big lunchtime salads. It's easy and delicious! I can kind of tell you how to make it, but I don't have an exact recipe. It only takes about 15 minutes from start to finish. Heat the broiler, line a baking sheet with foil, and position a rack over the pan. Remove the tenders from the breasts and thinly slice them. You can slice the breasts into 2 or 3 slices depending on how thin you like them. Take a small bowl and glug some olive oil into it. Add a pinch of salt and enough dried herbs to make a thick paste. Drag the breast slices and tenders through the herb paste and coat both sides. Place the chicken on the rack and broil for 8 minutes on one side. It will cook completely through and the side facing up with get a crust. Remove from oven, let cool, slice, and store. That's a great picture! 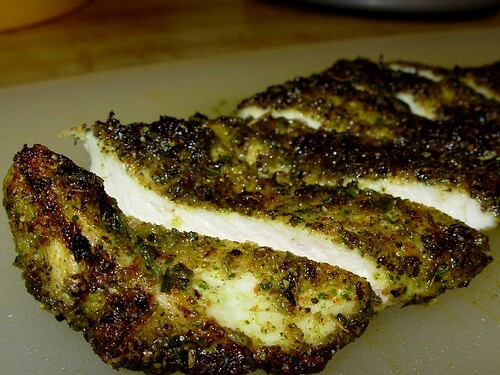 I love herbed chicken, thanks for the post. It is cold enough here already (I'm a wuss) that salad is not appealing to me. But the chicken is perfect for soups and stews. I make a huge veggie soup every few days and separately cook various protein sources to add to the soup base on different days. I think your chicken would be a great in that soup this week, thanks! I have been trying to post a comment to this particular post but for some reason it won't let me. Let's hope it works today. I had been trying to write that I just really love this photo of the green chicken! You take good pictures anyway but this managed to really capture the flavor. It looks amazing! Thanks for visiting my blog and by the way, the green eggs were great! I can see this becoming a staple around here, too. Lately I've been finding so much ease in following paleo by cooking several dishes at once, and portioning them up, freezing some, refrigerating others. This is perfect to have in the fridge, ready for salads. Bison meatballs are another such thing: I make them unsauced, and then they can be warmed up with different sauces (tomato, a brown sauce, a coconut curry sauce etc), tossed in soup or stirfry or just plain. With either the meatballs or chicken, you can always just grab one straight from the fridge for a quick snack, too.